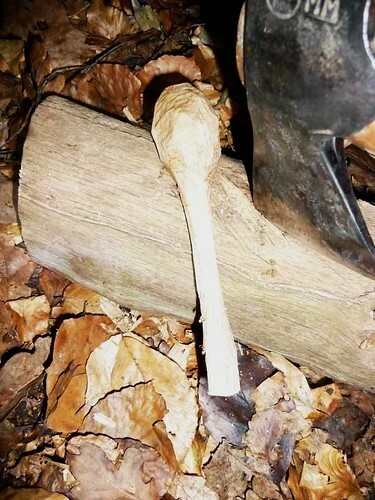 An Axe for splitting and preliminary carving. 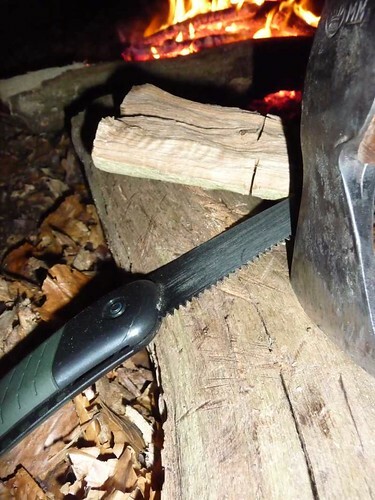 Here we use the Gransfors Wildlife Hatchet. A saw for cutting your first block and starting the shape. We find Laplander pruning saws very good. A strong sharp knife for carving. 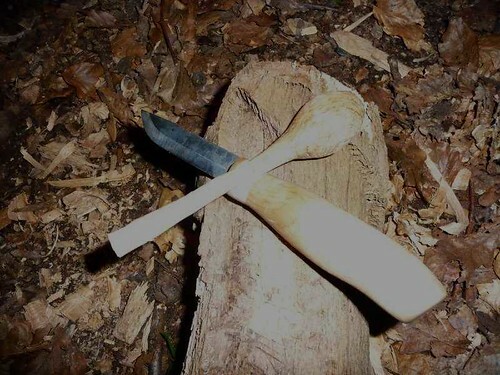 A crook-knife for carving the bowl of the spoon. Ginger makes beautiful crook knives, let us know if you wish him to make one for you. 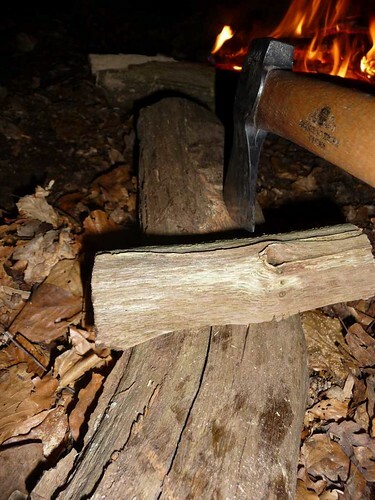 Start by finding a good solid piece of wood. Oak, Birch, Beech….experiment with different woods and their properties. 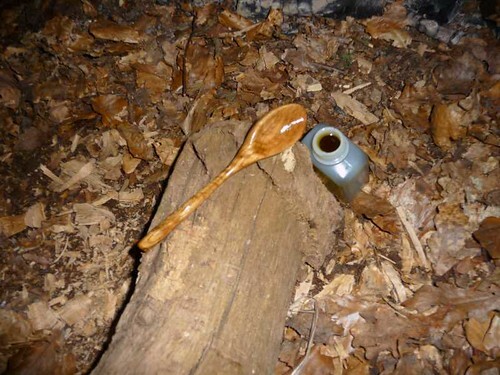 Look at the wood to find a shape that would accomodate your spoon and cut the basic block. Make sure there are not knots or splits that will cause problems later. 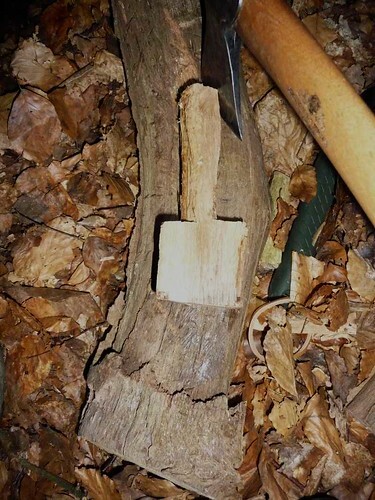 Split the wood in half with a sharp axe. Saw two square indents to achieve a basic shape. Split the wood from the top down to the saw cuts on either side. 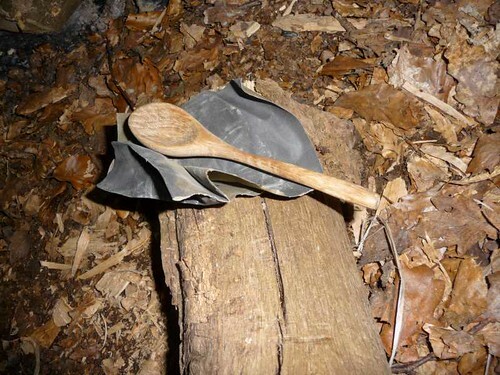 Start to work the shape with your axe, resting on a steady wooden base. 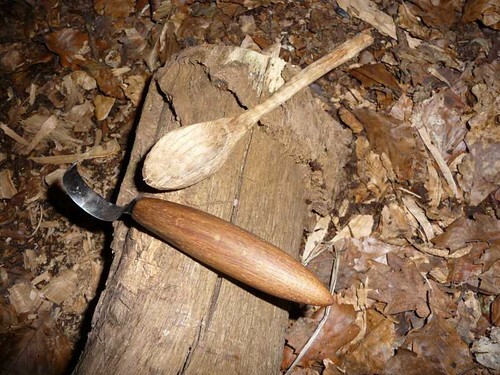 When the basic spoon shape has emerged and it is roughly the size you want, start to refine the shape with a knife, carving always with the grain of the wood. Carve the bowl of your spoon with a crook-knife. If the spoon is for eating with then test the shape in your mouth to see how it feels. Here comes a miracle. When the shape is refined and completed to your satisfaction, give the whole thing a thorough sand, making sure you’re sanding with the grain of the wood. When all is smooth, rub some oil into it. Any oil will do, olive oil, sunflower, vegetable, as you feel. Work it in and reapply until it is good and saturated. And there we are. You can re-oil it every now and again. The oil from the sides of your nose at eye level is particularly effective. 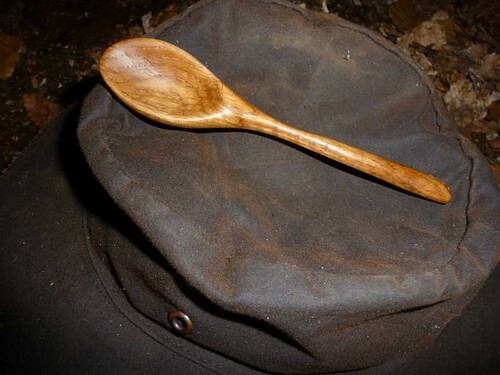 As well as spoons you can now make spatulas, wooden forks and other cooking implements. Perhaps find a good piece of wood that would split into two spoons that you and your love can carve together and exchange when finished. I love this and all your walking. This is so wonderful. 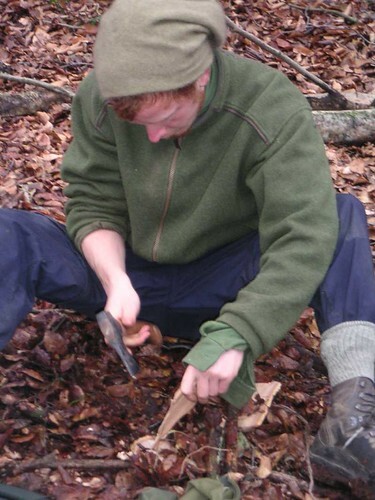 I heard about your walking on Radio 4’s Ramblings, and am delighted to have followed the leads to your site and this great documentation of spoon-making. I feel a very deep affinity to our land and ancient crafts – especially knitting. If you ever want to go for a long walk and learn about making socks from the fleeces of our native beasts, let me know next time you are in Oxfordshire/Berkshire. In the meantime, best of luck with the walking; it’s a beautiful thing you are doing.